Description: In case if you are carrying large or heavy NSF file which occurs problem to open or consumes much time, NSF to PST converter software provides the option to split the resultant PST files by maintaining data security. Hence, even after splitting PST file, users can easily accessthe files without having any trouble. 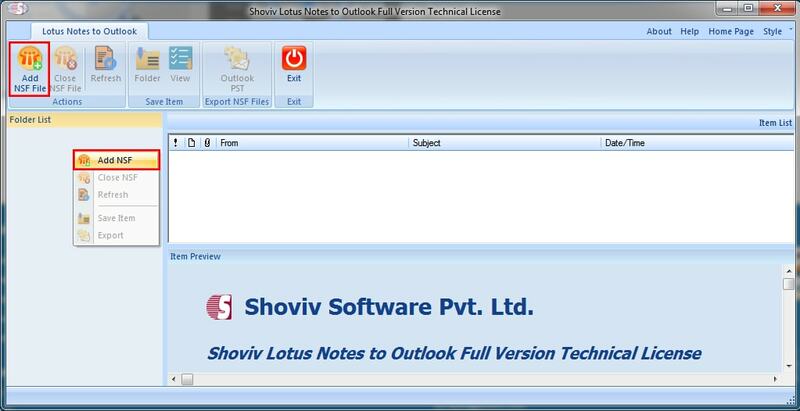 Lotus Notes to Outlook Converter maintains a proper folder hierarchy and keep themin the previous format. Thus, there is no risk of losing any metadata of the NSF file and the data will remain in same way. Lotus Notes to Outlook Converter software works smoothly with all IBM Lotus Notes version and support all Windows and Outlook Operating System. NSF to PST Converter software has free trial version which allows to convert NSF file and save first twenty five items per folder very quickly. It has 24*7 free technical assistance which is able to resolve any problems in quickest manner. Key-features : ? Guaranteed conversion from Lotus Notes to Outlook ? Bulk conversion from NSF to Outlook ? No file size restrictions to during data conversion ? User friendly graphical interface ? Folder hierarchy maintenance while converting from NSF to PST ? Support all Lotus Notes, IBM Domino, MS Outlook version ? Perpetual license and life time free technical support.